You love your kitchen. Its where countless memories are made throughout the years and the scene of many family dinners. But unfortunately, due to the popularity of this room, it can be very difficult to keep it clutter-free. But we’re here to help! By following a few simple rules, you can make sure your home is clutter-free and guest ready year-round. Check out a few decluttering tips below! Start with a fresh slate: The first step to decluttering your kitchen is empty out your pantry and cupboards. When emptying out your items, place similar items together. For example, group together your kitchen towels in one group and your kitchen appliances in another. This will help you to clearly see what items have to fit inside of your kitchen. Get rid of the excess: When combing through your items, be critical. If you haven’t used your food processor in years, get rid of it. If your daughter has been eyeing your extra set of dishes that you still have yet to use, give them to her. Any other items that you do not use should be donated, sold or given to family members. Use a pot rack to minimize cupboard clutter: Pots and pans can take up a lot of space in the cupboard. 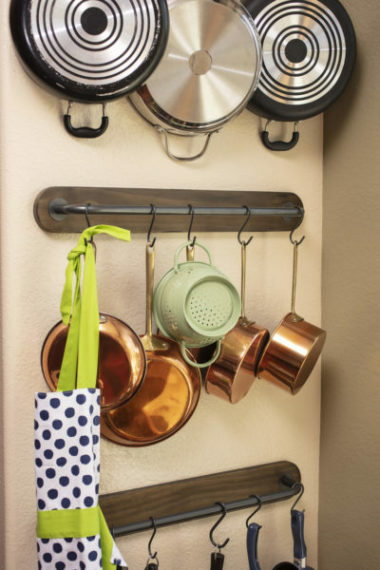 Instead of storing your pots and pans in the cupboard, install a pot rack along the wall. Purchase hooks to easily hang your pots and pans on the wall. Hang knives on the walls: Properly storing your knives will help to keep them sharp and in the best condition possible. Instead of storing your knives in a drawer, hang a magnetic strip close to your cooking area. This will also help to prevent injury from occurring. Use coordinating containers: Are you looking for more storage space in your kitchen? Add shelves to the walls! In order to avoid creating eye sores, store items in coordinating containers. Continue to declutter as you go: In order to prevent your home from becoming too cluttered again, it is important to continue to declutter. Take time monthly to go through your items more and declutter. As you’re sorting through your kitchen, you may find a few items that you don’t use very often but still want to hold onto. Instead of simply letting these items clutter your home, or worse, getting rid of them, consider a storage unit rental. A storage unit rental allows you to easily store items in a secure location close to your home. Are you looking for a storage unit rental near you? Lighthouse Self Storage has storage facilities in West Palm Beach, FL, Homestead, FL, Fort Lauderdale, FL, Whittier, CA, Westminster, CA, Oceanside, CA, Keep your home organized and reserve a 5×5, 5×10 or 10×10 storage unit today!